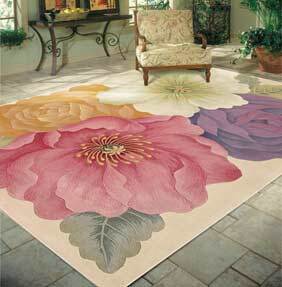 The Tropics Collection of rugs has been created by Nourison and offers a vivid, bold and floral accent to your home. The stylishly designed tropical floral rugs are hand tufted and hand carved and created with close care and attention from 100% premium quality wool pile. The hand carving process ensures that the designs have both real style and interesting, luxurious textures to appreciate and enjoy. The Tropics Collection features a range of boldly coloured and imaginative floral rugs, with a tropical feel. The range of different colourways ensures there is a stylish tropical-inspired rug to suit a wide range of different interiors.